Stocks recovered from deep losses posted earlier in the session but ended lower Wednesday, as investors welcomed the Fed's forecast of an improving economy amid lingering fears about the global economy. shares of Caterpillar and Boeing falling more than 2 percent. The U.S. and its military allies agree on many things, from the size of bullets for their rifles to the design of future fighter jets. But on the issue of gays in the military, the U.S. stands alone among the Western allies. Oil company BP told federal regulators it could handle an oil spill more than 50 times larger than the one it is now struggling to contain in the Gulf of Mexico, according to documents and congressional testimony Wednesday. On the heels of two deadly attacks against U.S. forces in Afghanistan this week, U.S. Defense Secretary Robert Gates is expected to brief reporters at the Pentagon Thursday afternoon. Gates is expected to address the brazen attack Wednesday by insurgents on the U.S. air base in Bagram, Afghanistan which wounded nine troops and killed one U.S. civilian. A car bomb attack Tuesday killed five U.S. troops and one Canadian soldier in Kabul. Gates is also expected to address the South Korean government's announcement on the results of the investigation into the sinking of a naval ship in March. U.S. officials have said the South Korean warship was hit by a torpedo launched by North Korea. South Korean media reports have said South Korea will blame North Korea for the attack. Thursday's briefing will be his first since he spoke to reporters more than a month ago with Joint Chiefs of Staff Chairman Adm. Mike Mullen, Secretary of State Hillary Clinton and Secretary of Energy Steven Chu to announce the new Nuclear Posture Review. In the latest loosening of government involvement in Cuba's still predominantly state-run economy, private farmers in the country will be allowed to bypass the government bureaucracy and purchase goods directly from suppliers. 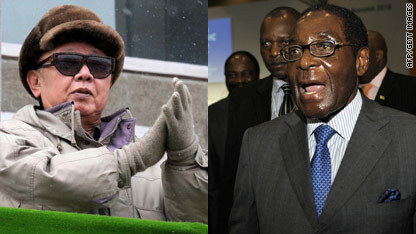 Robert Mugabe, right, is said to be giving two of every species in Zimbabwe’s Hwange National Park to North Korea's Kim Jong Il. North Korea is paying $10,000 for each of the two young elephants it is getting from Zimbabwe in what had been dubbed a "Noah's Ark" wildlife gift, according to reports from Zimbabwe’s capital on Wednesday. Vitallis Chadenga, Zimbabwe’s parks chief, said the elephants and other animals are being shipped from Zimbabwe’s Hwange National Park to North Korea as part of a simple business transaction and are not a gift from President Robert Mugabe to North Korea’s Kim Jong Il, according to a posting on Earth Times. Three armed men robbed famed Puerto Rican golfer Juan Antonio "Chi Chi" Rodriguez of about $500,000 worth of jewelry, watches and other personal items in his home early Wednesday, police said. The crime occurred about 1:30 a.m. when the robbers broke into the golfer's home at El Lagado Resort in the southern Puerto Rican city of Guayama, police spokesman Wilson Porrata said. The robbers tied Rodriguez up before making off with the merchandise, Porrata said in a statement. Rodriguez, 74, and his wife were not injured. Rodriguez had the first of his eight PGA Tour wins in 1963. With a fresh set of tough sanctions on the table, Iran lashed out Wednesday against U.S. efforts to punish the nation for its nuclear program. 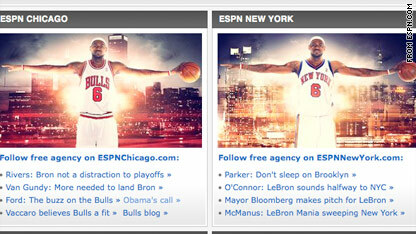 LeBron James is featured on ESPN in a Bulls and Knicks jersey -- further fueling the fire about his free agency. Even though his Cleveland Cavaliers were eliminated from the NBA playoffs last week, LeBron James is the league's most talked about player right now because of his impending free agency. On July 1, any of the league's teams can try to woo the league's most valuable player to change uniforms with the promise of hundreds of millions of dollars and championship glory. Before then he can only talk officially to the Cavs, which hasn't stopped the rumor mill and sales campaigns from going full blast around the league. If you just can't stand the wait, you can monitor exactly how many days minutes and seconds until things really get swinging on ESPN's LeBron tracker. That's right, a countdown to his free agency, that's how big this is going to be. The quest to sign LeBron has practically become a sweepstakes - a contest who can woo the big star the best - with lobbying campaigns that could put Washington to shame and sales pitches farther over the top than Vince the Shamwow guy - all to convince King James they are the right choice. [Updated at 12:34 p.m.] President Barack Obama said during a meeting Wednesday with Mexican President Felipe Calderon that Arizona's immigration law is a "misdirected" expression of "frustration." 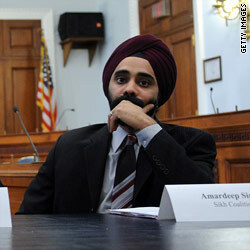 He said his administration is taking a close look at the law, particularly in terms of its civil rights implications. [Updated at 12:26 p.m.] U.S. President Barack Obama said Wednesday during a meeting with Mexican President Felipe Calderon that the two leaders have agreed to work toward a U.S.-Mexico border that is "modern, secure and efficient." [Posted at 10:23 a.m.] Mexican President Felipe Calderon said at the White House Wednesday that Arizona's controversial new immigration law is causing "our people to face discrimination." Calderon made his comments during a news conference held with President Barack Obama. Filed under: Barack Obama • Immigration • Mexico • U.S.
Faisal Shahzad was arrested in connection with an attempted bombing in Times Square. [Updated at 10:51 a.m.] CNN's Susan Candiotti has obtained Faisal Shahzad's mugshot, which is the first new photo of the attempted Times Square bomber, since he was arrested for his association with the plot in Manhattan. 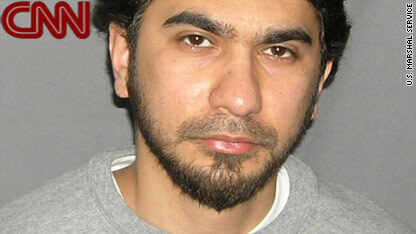 The photo was taken after Faisal Shahzad was formally placed in the custody of the U.S. Marshals on Wednesday. He’s shown wearing a grey sweatshirt — the same clothes he wore in court. Unlike earlier photos taken before he was arrested, he now has a slight beard. [Posted at 10:40 a.m.] Attempted Times Square bombing suspect Faisal Shahzad is being held at the Metropolitan Correctional Center in lower Manhattan, a federal law enforcement official told CNN. Pakistan is blocking access to Facebook in response to an online group calling on people to draw the Prophet Mohammed, officials said Wednesday. A Pakistani man arrested at the U.S. Embassy in Chile last week when his clothes tested positive for explosives said Tuesday he was innocent and maintained a positive outlook. "I strongly believe that there is a big misunderstanding stemming from a mistaken identity," Mohammed Saif-ur-Rehman Khan told reporters in Santiago after a meeting with his lawyer. "I want to assure you all that the allegations laid against me are baseless and false." The Senate Judiciary Committee will begin hearings June 28 to consider the nomination of Solicitor General Elena Kagan for appointment to the U.S. Supreme Court, the panel's chairman, Sen. Patrick Leahy, said Thursday. 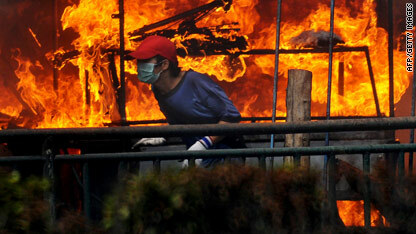 A Thai anti-government protester runs beside a burning shop Wednesday in Bangkok. Thai protests - The deadly standoff between the Thai government and protesters reached a boiling point Wednesday as security forces surged into Bangkok's Lumpini Park, with at least five people dead in the largest offensive on protesters since demonstrations began. Residents in the capital took to rooftops and anxiously watched news reports, while some fled with precious keepsakes as they feared a mini-civil war was coming. For those who decided to stay and are now trapped in Bangkok, there is only one thing left to do: hunker down. Midterm election primaries - Voters sent mixed signals in Tuesday's primaries in Arkansas, Pennsylvania and Kentucky. They tossed out a longtime senator, picked a Tea Party-backed candidate and forced a Democratic senator into a runoff. CNN's political analysts give their take on what it all means and how it may affect midterm elections in November. The new British government plans to replace the House of Lords with an elected second chamber of Parliament, Deputy Prime Minister Nick Clegg said Wednesday. Tar balls discovered on the Florida Keys shoreline are not connected to the oil spill in the Gulf of Mexico, the Coast Guard said Wednesday. 10:00 am ET - Gulf Coast oil spill hearing - The House Transportation and Infrastructure Committee holds a hearing on the massive oil spill in the Gulf of Mexico. Officials with BP, Transocean and the EPA are expected to testify. 10:00 am ET - Rebuilding Haiti hearing - Actor/activist Sean Penn testifies before the Senate Foreign Relations Committee on efforts to rebuild and revitalize Haiti following this year’s devastating earthquake.